Cockatoos and true parrots, the psittaciformes, or psittacines, are among the longest-lived "citizens" of the wilderness and are among the most colorful, intelligent, dignified and mesmerizing of all creatures. 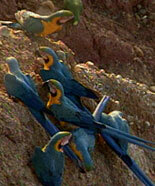 They are also Threatened and Endangered in most parts of their geographic distributions. Many years in the making, Parrot is the authors' deeply personal testament to that wide- ranging Order of birds, the psittaciformes. The gorgeously illustrated book takes the reader throughout the history of ornithology as concerns these glorious species, and shares remarkable moments of communication, insight and reciprocity that the authors (having lived most of their lives in the company of parrots) have experienced. Utilizing rare illustrative material from many of the scarcest ornithological collections in the world, the authors also take the reader onto several expeditions in New Zealand, South America, West Africa, and parts of Central and Southeast Asia, in search – not necessarily of the rarest – but the most provocative of psittacines, as well as investigating the early histories of two now-extinct parrots that inhabited the United States, and at ill-fated attempt at reintroductions. Filled with personal anecdote, observation, and intoxicating science, Parrot examines CITES and other legislative policies to suggest large ecosystem protections for these birds, particularly in an era of pro-active global warming strategies; and seeks to extend the animal protection awareness that has gained leverage with Great Apes and marine mammals, to the psittaciformes. In so doing, the book acknowledges explicitly that these birds co-exist cognitively with mammals, and that their intelligence may often, in fact, outstrip our own. With unabashed lyricism, this book is sure to stir up in readers the restless flight feathers that reside in our souls. Descended from C. aegagrus in Central Asia, this most ancient of domesticated species, the Goat, or Capra hircus, is found at high altitude, on glaciers, along marine coastlines, and in the Sahara. 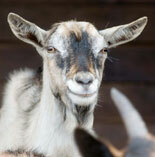 In other words, goats have traveled the world with the same free spirited biological wanderlust as humans. And their expressions, personalities, and vast behavioral varieties reflect this primeval journey. Goats have figured in a myriad of classics: from the Bible to Chaucer, from the Renaissance pastoralist tradition, to the great illustrators of Aesop, La Fontaine, the Georgics and the many Arcadias. Goats, like donkeys, are also exploited for their milk, their meat and their hair, and are often as beloved a companion animal as dogs. In this joyful, wide-ranging examination of the mystique of goats, from their appearance in Shakespeare's "Tempest" to their role in the tribal societies of Asia and Africa; Goat: The Mystique of Capra Hircus will provide insights into one of the world's most adored, whimsical and independent of creatures.